Containment Protocols: RPC-432 is to be kept in a secured locker at Site-83. Due to RPC-432's anomalous properties, RPC-432 is to be encased in a plastic sheet to prevent sight of its interior during cleaning or maintenance of its containment area. 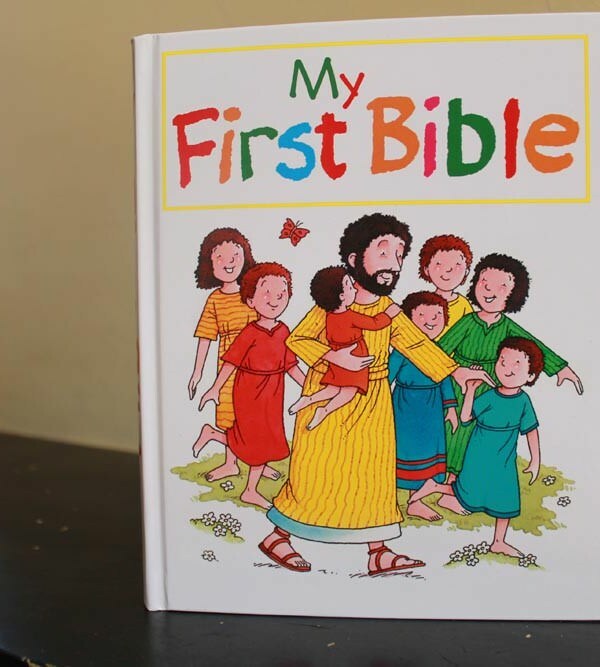 Description: RPC-432 is a hardcover children's bible with the words "My First Bible" written in a colorful font on the front of RPC-432, accompanied by a pastel-colored drawing. The pages of RPC-432 are written in an unknown language similar in style to Hebrew, although all attempts made at deciphering the language thusfar have failed. RPC-432 was retrieved by Authority Personnel Team "Petrol" through purchase via RPC-333-A. RPC-432's anomalous properties arise when any humanoid of age 19 years or older makes visual contact with the interior pages of RPC-432. An immediate loss of consciousness will occur, lasting a recorded amount of 12-15 hours. Upon awakening, said subject will be affected by sudden and untreatable insanity. Humanoids affected by RPC-432 will be incapable of filling basic human needs such as feeding and sleeping, and will instead replace all actions with constant verbal expression and praising of religion and Christianity, and obsessive actions regarding RPC-432. Subjects affected by RPC-432 will die of dehydration or malnutrition if their basic needs are not attended for. Addendum 432-1: Dr. █████ suggested the effects of RPC-432 could be reversed through heavy usage of amnestics and therapy. The following is a log of five CSDs that were tested upon. Test: (1) regular dosage of Class-B Amnestics were administered. Result: Subject was momentarily dazed after awakening from unconsciousness, although showed no visible change from RPC-432's anomalous effects. Test: (1) regular dosage of Class-C Amnestics were administered. Result: Subject was heavily dazed after awakening from unconsciousness (Not uncommon after usage of Class-C Amnestics), and continued to stare at Dr. █████ for several minutes until the effects of RPC-432 returned. Test: (1) regular dosage of Class-B Amnestics were administered, regular therapy for (2) months was enacted. Result: Effects of RPC-432 on subject has not changed. Note from Dr. █████: The therapy was excruciating. He didn't listen and only kept on rambling. Further therapy attempts will be ticked off. Test: Heavy chemical usage was administered to induce a long-term coma. Result: Subject was comatose for 3 months, and suffered major brain damage after awakening. Despite this, no mental change from the effects of RPC-432 was seen. Subject suffered notable impaired motor functions. Note from Dr. █████: Never again. I'm leaving early. Addendum 432-2: A janitorial staff (Vincent ██████) had accidentally viewed the interior of RPC-432 during a routine cleaning of its containment chambers, after which another staff member noticed him and brought him to the medical bay. After he had awoken, he fled to a storage room located in the west wing of Site-83, taking RPC-432 with him and locking himself in. An audio log was recorded with Dr. ███████ attempting to coax him out of the room. Dr. ███████: Our security cameras can see you. Open the door right now, we can help you. Vincent ██████: Help? Surely, you jest. I require not help, for I have achieved transcendence. You, you need help. Your stenches reek of irreligion and mortality. Let me leave this building in peace, I must show the public the truth of this world. Dr. ███████: Tell me about this truth. Vincent ██████: The TRUTH is this book. GOD has brought it unto us, so we may know what mortals may not. Can you not see the beatitude of this? For the holy light blinds me, His blessed rays have taken my sight and now all I see is the TRUTH. Dr. ███████: I understand, you must be very lucky to be chosen by God. Please open the door, so we can show everyone the truth. Vincent ██████ unlocks the door. Closing Statement: A blindfolded recontainment team was sent in to capture Vincent ██████ and contain RPC-432 right after he unlocked the door.